Don't you just love the phrase "get your ducks in a row"!?! Even better than the phrase is the actual accomplishment of the task. 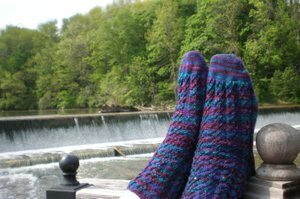 Introducing Waterfall socks. 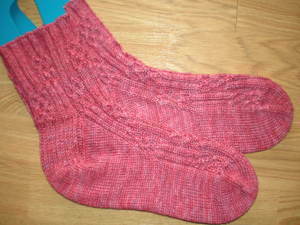 This month's Sock Knitters Anonymous challenge was to knit one of Anne Hanson's sock designs. These were so much fun to knit! The modifications: Toe-up, of course. The rough outline of the modification is on my Ravelry project notes. Basically, the biggest detail to keep in mind is that the top of the foot should have 31 sts while the sole has 30. This allows for the pattern to be worked across the foot while beginning and ending with P2. The other modification was to make a shorter cuff (personal preference) even though there was enough yarn to go longer, though not as long as the original design. 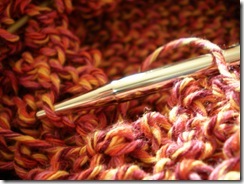 Overall, the pattern and the yarn will be "repeat offenders" in the future! But, what does it have to do with Ducks in a Row? Sunday, June 1, begins the new year of the 52 Pair Plunge. My goal this past week has been to get all of the SIPs (socks in progess) of my needles so that June 1 begins with a clean slate. Way too much time has been spent on Ravelry sorting my queue to get my sock knitting line-up in order. 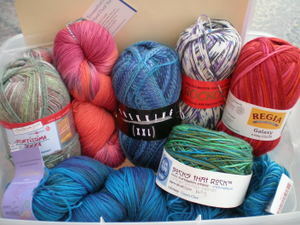 Ampersand, Anastasia, Mingus, Diagonal Cross Rib, Brother Amos, Swirl Socks, Spring Twists, Eloise, Francie, Tessarae. (Plus, two designs in my head that want to pop out!) Talk about sock ducks in a row!!! June 1st can't come soon enough. Two days of sunshine and warming temps has me itching to get outside. We aren't nearly as far along with spring as some others are. 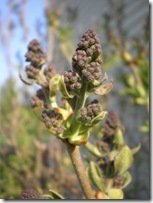 Check out my lilacs. 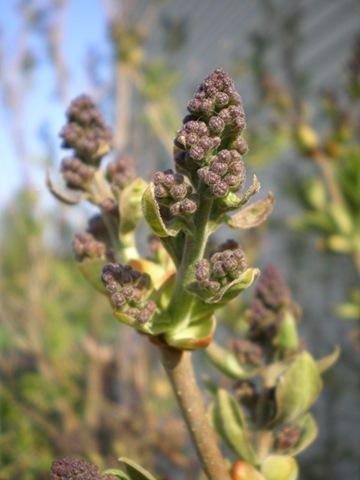 They're not anywhere near popping, unlike Knitspot's lilacs. 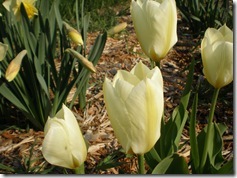 But, a few of the tulips are making their presence known amongst the daffodils. Spring is finally arriving in Eastern Wisconsin. (It's about time!!) 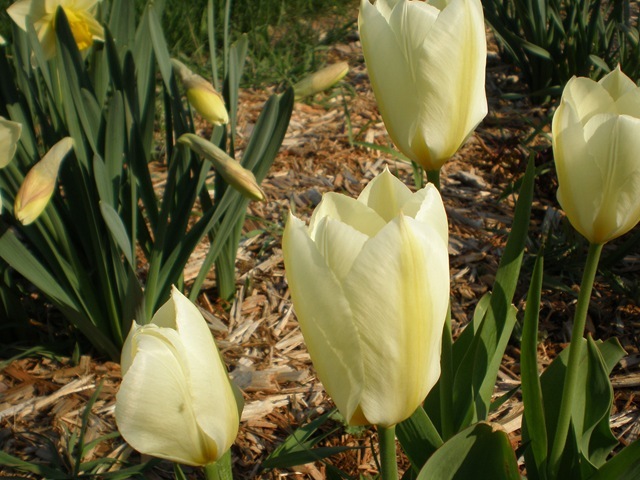 I'm so glad that so many knit bloggers have been posting photos of their own blooms...it reminded me that spring would eventually arrive! Sounds like a good idea...or maybe it's an April Fool's joke...all I know is that right now, the last thing I want to knit in the evening are socks! My bucket still looks pretty full. Looking back it seems the only things knitted this past month from the bucket/s were socks! Time to change that. Look at that pretty orange...time to infuse some "spring" into my knitting even if it doesn't seem very spring-like outside. The robins are returning and their chirping cries out "What the heck am I doing back here!?! It's cold!" We think our knitting will make the difference. A new spring vest would be just the thing to wear on a nice spring day. It seems time to pack away my dark winter vest. (Or at least once it's no longer needed for sizing comparisons!) Maybe, once the pink vest is finished, spring will truly arrive. How's that for the power of positive thinking? But, Fairy Godmother is finishing a sweater that she'd hoped she could wear yet before it got too warm...maybe her knitting "magic" is stronger than ours. Let's hope not! Then again, MN (where she lives) just had a snow storm. Time to get moving on the spring vest! 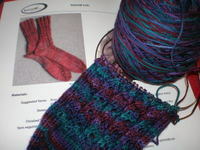 This is what's left in the bucket from last month...an unfinished shawl and pair of socks. To review, here's how it looked in February. 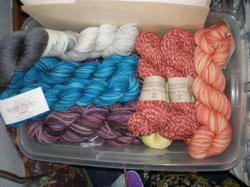 Enough yarn for two shawls, four pair of socks, and two wash cloths. It feels pretty darn good to only have two items left in the bucket! You've seen the Socks for Panda and socks for me. But these, are the ones that started at the dentist office. 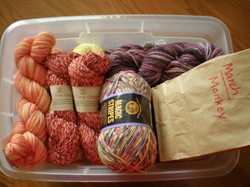 These have been in my queue for a long time: Brigit by Momma Monkey (#8). They got moved to the top of the queue after new of her death hit blogdom. Since then, her blog and patterns are gone. But there are Ravelers working with the family to get these gems reposted for everyone. I'll keep you posted. Of course, mine were modified to be done toe-up. It has me itching to write a few more patterns. Maybe once vacation rolls around. 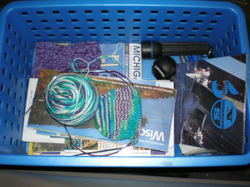 In the meantime, back to the other items from the bucket...Icarus is finished and blocking. Tomorrow should be its big day in front of the camera. That left the wash cloths. 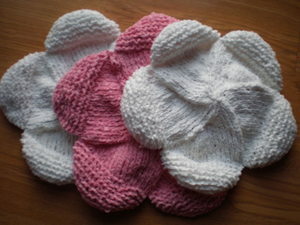 Christmas past (pre-blog), I knit at least 15 of the flower washcloth pattern. They made great last minute gifts. This year, my goal was to have a few stored up for those last minute needs. Imagine my delight at finding an even easier pattern! The swirl in the middle is delightful too compared to the original pattern. 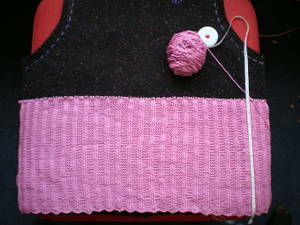 The pink was knit with US 6 and the white with US 5. In the end, the pink used 36 grams and the white 33 grams. 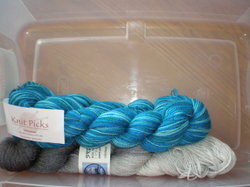 Still can't quite get two from one skein (white leftovers from Christmas past did the trick for these). Time to get creative with all of the leftovers...but that's another bucket! They haven't made their way into the next one. Two pairs of socks, one scarf, one shawl, one market bag. But, I'm itching to make something a bit larger...something that won't fit in a bucket...what's a girl to do!? !